If you have or are building a walkway in your landscape, having proper lighting in place is critical to the safety and security of your family and your property. At O’Grady’s Landscape, we can create a pathway lighting design that not only accomplishes these goals but also brings added beauty to your outdoor space. We have been serving the Northern Virginia area since 1991, working with all types of clients and properties to build outdoor living spaces that are both beautiful and functional. 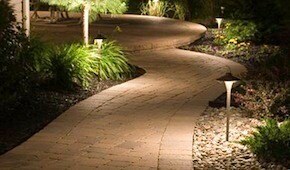 GET A FREE QUOTE ON YOUR PATHWAY LIGHTING PROJECT TODAY! LED walkway lights – this is the environmentally-friendly choice for pathway lighting, as LED lights use at least 75 percent less energy and last 35 times longer than incandescent. They are also extremely stylish and are considered optimal lighting for any environment. Low voltage pathway lighting systems – low voltage walkway lights use less energy than other lighting systems, allowing you to save on your monthly energy bills, and are also less expensive to install and safer than your standard lights. Automatic pathway lighting systems – we can install pathway lighting with photocell control to keep your lights on a schedule—they’ll turn on at dusk and off at dawn. We can also provide you with an automatic timer that allows you to control how long your lights stay on. We install walkway lights by CAST, considered to be some of the finest products in the market for their durability, beauty, and reliability. They are also very low maintenance. O’Grady’s Landscape specializes in all types of outdoor lighting, including pathway lighting, for Northern Virginia homes. We can help you create an aesthetic and highly functional pathway light design that complements your landscape and home. Our goal is to give you the peace of mind that comes with knowing your property is safer and more secure—and as a result, your family too—while making your landscape a more beautiful place. If you are interested in learning more about our pathway lighting design and installation services in Virginia or are ready to schedule a consultation with our designers, contact us today.